Titanium is renowned for its exceptional resistance to corrsosion. This tremendous resilience allows it to resist attack by acids, moist chlorine gas, and common saline solutions. Due to its high-tensile strength (even at high temperatures), light weight, extraordinary corrosion resistance, and ability to withstand extremes of heat or cold, titanium is now used in a variety of high-tec applications, from amour plating to spacecraft. The durability, lack of weight, and attractive nature of polished Titanium has made the metal ideally suited for the manufacture of spectacle frames, watch casings, and particularly the crafting of jewellery. This results in an extremely attractive, resilient and long lasting product. When deep engraved, titanium produces an extremely sharp cut that will not loose its crispness over time. 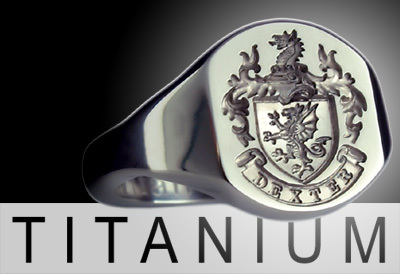 A Dexter Titanium deep engraved ring is able to endure the most extreme of activity, either on land, in the air, or in water and look as good in years to come as it does today.